Cinereous Vulture (Aegypius monachus). Taken at Extremadura, Spain, on November 14th 2018. The Cinereous Vulture is distinctly dark, with the whole body being brown excepting the pale head in adults, which is covered in fine blackish down. The skin of the head and neck is bluish-gray and a paler whitish color above the eye. The adult has brown eyes, a purplish cere, a blue-grey bill and pale blue-gray legs. The wings, with serrated trailing edges, are held straight or slightly arched in flight, and are broad. At up to 14kg it is one of the world's heaviest flying birds. It is a Eurasian species. The western limits of its range are in Spain and inland Portugal, with a reintroduced population in southern France. 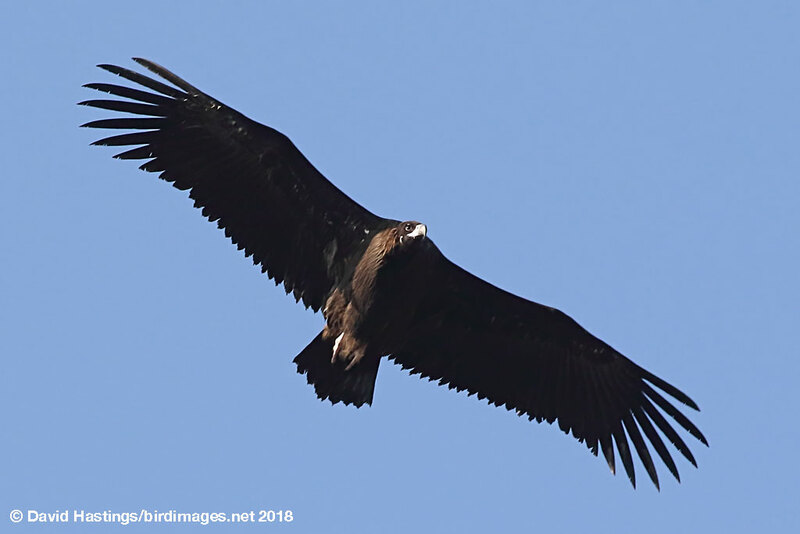 The Cinereous Vulture is a bird of hilly, mountainous areas, especially favoring dry semi-open habitats such as meadows at high altitudes over much of the range. Nesting usually occurs near the tree line in the mountains. They are always associated with undisturbed, remote areas with limited human disturbance. It is a largely solitary bird, being found alone or in pairs much more frequently than most other Old World vultures. It is regarded as Near-Threatened by the IUCN.